Once you get beyond the beginner techniques of solving sudoku puzzles, the correct number to place in a single cell is not always immediately obvious. You will have to narrow the candidates down to a list of possible numbers. Intermediate and advanced techniques involve removing candidates from cells until there is either a Naked Single or a Hidden Single and the number can be placed. Naked singles are very easy to spot with pencil marks because there is only 1 number left. Hidden singles are a bit harder to find with pencil marks. The number will only be available in one cell of the row, column, or box that you are searching. When doing a sudoku puzzle on paper, it can be time consuming but very helpful. You go through each unknown cell and look at all of its “siblings”. That is, you look up and down the column, left and right on the row, and at every other cell in the box. In your head you count all the numbers 1-9, and any number that has not been used in a sibling gets noted in the cell. Once you start to fill in the available candidates on several cells or even the entire rest of the board, you are ready to start using advanced techniques. 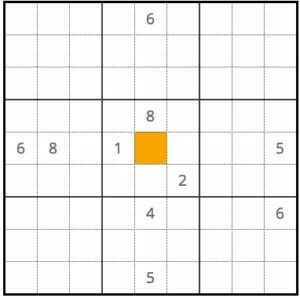 The siblings of the orange square have used every number except for 3, 7, and 9. The pencil marks for that cell will be 3, 7, and 9. 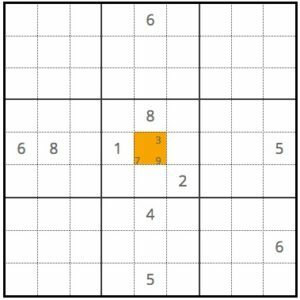 When using a computer application to work on a sudoku, many times there will be a feature to automatically fill in the pencil marks. The hint generator on this site has a pencil mark checkbox that will do exactly that.